This week has been a dazzling mix of being steeped in autism—both in terms of daily life and also engaging with the topic through reading—and dipping my feet outside of Autism Land to do other things. It’s amazing how shocking it is to realize there is a whole world where there exist people who do not ever have to think about this topic which is so engrossing to our family. It is also disorienting. And disheartening. Because that reminds us with a nice big donkey kick that the issues which matter so much to our child’s wellbeing are nowhere on the horizon for those unaffected, and the fact that this disconnect impacts his life is also a minor factoid in the larger world. People only have so many resources to engage with stuff that is outside their sphere, and I am no exception. I am just throwing out there that interacting with Neurotypical World is jarring, and, to be honest, not always preferable to our daily situation. R pointed that out the other day too. He has been attending a babysitting class for teens who want to learn how to watch kids with special needs (a valuable resource, and one which should be offered everywhere) and he said that some portion of the teaching inevitably has to describe autism behaviors to people who don’t understand them from a first person perspective. He chuckled and said, “So this is how neurotypicals view us.” I felt a twinge of deserved shame as he spoke. I am one of the biggest arbiters of my kids’ immediate destinies, and am often having to guess at intent and underlying emotions. In Desi Land, I often hear parents talk about how they know what their kids’ wishes are on a certain topic, but then they override those wishes because other factors weigh more heavily. In Autism Land, it’s the opposite; we want to factor our kids’ wishes in, but we have very erratic and incomplete data to work with. A has been getting really sassy on his speech app, by the way. He loves haircuts, and asks for one every fortnight. Yesterday it was kind of late when he asked, so I said, “Is it okay if we do that tomorrow?” The little stinker replied on his app, “No.” Then he gave everyone withering side eye for smothered giggles. We waited so long for this app fluency to come, and now we have teen hardheadedness to listen to! 😉 He did have his haircut the next day, and looks like a beaming, self satisfied, scraped coconut. My husband, R and I went to an ABBA tribute concert last night. It was ah-may-zing. At the end, I was up on my feet dancing it out with the other middle aged mommies, and I felt such a blaze of ridiculous joy and energy. I wish my sisters had been there to shake it out with me. It was like being a kid again, except with better behaved hair, and a love of tea. There are few women my age whose lives have not been made better by ABBA, I tell yooooo. And I am not talking about that Mamma Mia movie silliness. Today, R and I met up with a friend at the Sugarloaf crafts festival. We feasted our eyes on amazing jewelry, pottery, scarves, paintings, furniture, and so much more. I love hearing artists talk about their work too. Such a treat to be witness to the talent of people who keep craftsmanship alive. I kept thinking how, if A could get past the crowds and his own tendency to run off, he would have loved the sensory input of the artistic works that were everywhere such a delight to behold. But of course, that is my neurotypical nonsense rearing its head. If he could easily override those things, he would not be him. Perhaps the best we can do is to keep checking what runs through our minds and comes out of our mouths, regarding special needs. These things have a sneaky way of shaping our decisions, after all. Centering our own perspective is natural, but we can do better. I love this post. 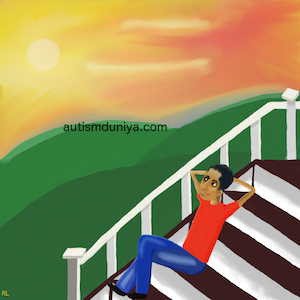 I don’t have children but I am on the Autistic spectrum. I am currently volunteering at church to help young adults who have special needs and I am around them so much that their quirks and differences don’t phase me; and it doesn’t seem to phase anyone else either. We all accept each other and it is a really caring and loving environment and a wonderful ministry. Sadly when I tell other people about the ministry ( outside of my church friends); they don’t seem to be interested; in fact I don’t think they care. A lot of people who don’t have special needs or don’t care for someone who does; would rather not think about it; it makes them uncomfortable; which is sad to me because with special needs are the kindest people; they are funny and great to be around; sadly most don’t see it that way. Hi Dave, Thank you so much for your thoughtful response. It really touched me. I love your blog; it is so honest, and gives me a lot to think about. Just today, I was trying to have a conversation with someone about autism, and I realized it was not going anywhere, so I decided that I can only do what I do and not worry about the rest. It makes me happy to read about your involvement in the special needs ministry. I think it’s really important that self advocates show us caregivers the way forward. You have my respect. Taking action is infinitely more difficult and valuable than good intentions unrealized. Isn’t the speech tech so cool? And I am always gaping with awe at how intuitively it is designed, plus how quickly my son is able to grasp it. He is so much better at this stuff than I am. Thank you for your kind words. We do adore our little guy, and my favorite request on the app is when he presses “I want squeezes.” HAPPY TO OBLIGE, MR MAN! Hugs from him are the best. Be well. I am blessed to connect with such a thought provoking blogger. It’s nice to be in the outside world once in a while. It has a correction effect. Even when you go back to your own world, the relaxation is helping. Thank you Sadje! I apologize for my very tardy response… So many daily life things have gotten in my way, aargh. And I do agree, we all need to step away from the focused tasks sometimes, and remember to play. Indeed it is. I did nominate you for a Sunshine Bloggers Award.